Khanna has opened another ‘Junoon’, in Dubai. 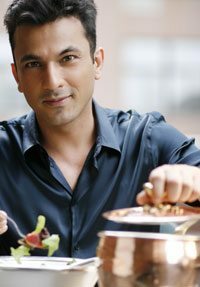 WASHINGTON, DC: Award-winning, Michelin-starred Indian chef Vikas Khanna could be the protagonist of an upcoming Hollywood biopic. The Hindustan Times reports that he’s already been approached by studio executives about making a film out of his life’s journey from Amritsar, Punjab to the U.S.
“Yes, it’s true. A Hollywood studio has approached me for this project. The plan is that I will first release a book, like a biography, and then follow it up with a movie,” Khanna disclosed in a statement. In fact, representatives from the yet unnamed studio have already reconnoitered the area where Khanna was raised as a child in anticipation of filming. “The preparations have already started. I recently took them to Amritsar to show them that side of my life,” said Khanna. Khanna, who will soon be seen on millions of television sets as the host of the reality-cooking show, MasterChef India, has specifically asked the studio to cast a Bollywood actor in the biopic’s titular role. “My only condition for this was that they cast an Indian actor. I want someone whose art I believe in to portray me. I want either Aamir Khan or Farhan Akhtar to play me. In fact, even Nawazuddin Siddique would be good. The story will be my life, how I made it work in the west and then came to home ground to promote the MasterChef franchise,” he revealed. The film will be put on hold for some time as Khanna wishes to focus on MasterChef India, according to the Times. Khanna’s life story is certainly an intriguing one. He was born with misaligned legs and feet and wasn’t able to run until he was 13 years old. After falling in love with cooking in his grandmother’s kitchen, which served as the base for his foundational training, he has gone on to cook with some of the most influential chefs in the world, including Gordon Ramsay, Bobbly Flay, and Jean-Georges Vongerichten. Along the way, he’s garnered titles such as “New York’s Hottest Chef” and been named to People Magazine’s “Sexiest Man Alive” list. Khanna’s restaurant in Manhattan, “Junoon,” has consistently earned a Michelin star since its opening in 2010. Success has not slowed him down in the slightest; to the contrary, he opened a second location earlier this month at the Shangri-La Hotel in Dubai. Not one to take a hands-off approach, Khanna is slotted to make a celebrity appearance there on January 18.